Weekly Happenings: This past week was rather laid back. Often times, when we get back from vacation, I feel like I need a vacation from the hustle and bustle that was the actual vacation. I usually accomplish this by not planning much for us to do during the week after we get back. It allows me to get back into the routine and just relax. Paul obviously still needed to go to work, but he’s still on break from school, so he’s getting a pseudo-vacation of sorts in that he doesn’t have to start working on homework almost immediately after he gets home from work. Joseph has been really enjoying the extra “Daddy-Joseph time” as he calls it. The Weekly Weather: It’s been HOT (as in, over 100 degrees almost every day) but not QUITE as humid (still more than I’d like, though, haha). Yesterday brought a return of higher humidity along with some rain and slightly cooler temperatures (mid-80s to low-90s). What Paul’s Been Up To: He’s back to work after vacation. He volunteered to go in for some overtime yesterday (which will be a huge help financially with us having had to essentially get all new tires for the Mazda while on vacation). He’s also been spending a lot of time with Joseph, which Joseph absolutely loves. I love to see them together! What Sarah’s Been Up To: Getting back into the swing of things, mainly. I attended a baby shower for a friend (there are quite a few women in our ward that are pregnant) and got some much-needed girl-time. I’ve also had to start dealing with the occasional bout of Braxton-Hicks. Thankfully they haven’t brought pain; only pressure. I don’t remember getting them this early with Joseph, but then again, I may not have realized what they were at the time (I think I remember my doctor asking if I was having them and I wasn’t sure until he described them). I was also able to cook food (namely chicken) without feeling nauseous! Though it sounds rather trivial, it’s a huge thing in my book! 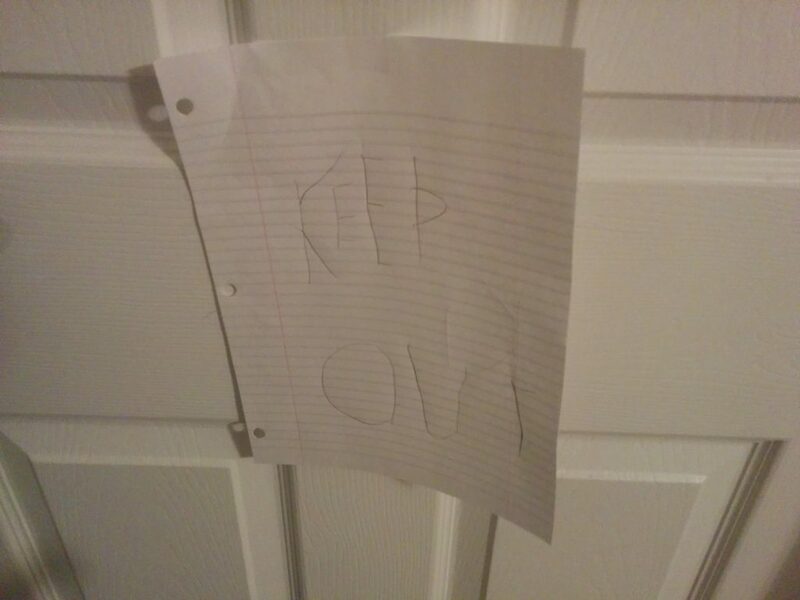 Joseph asked me how to spell “keep out” because he was making a sign for his door. After telling him which letters to use, I asked him why he needed the sign. He said it was because he made a mess in his room and didn’t want me to see. 😂 After he made the sign, I helped him clean up his room (it wasn’t all that bad, actually). 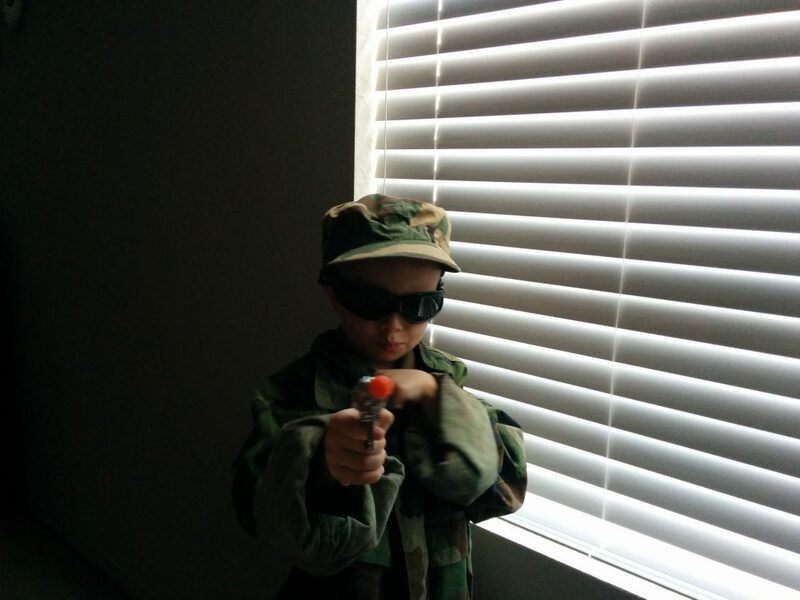 It’s good to know that I’m sufficiently protected (even though his pose has his gun pointed right at me, haha).